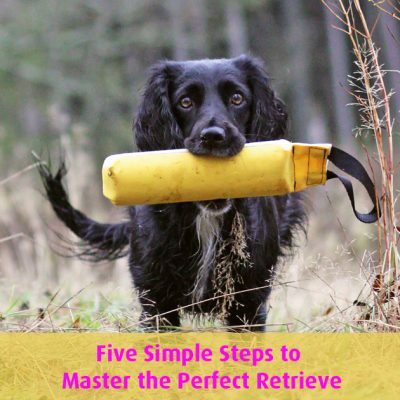 Our friend and instructor, Åsa Jacobsson, has kindly let us use this article with her 101 tips about retrieving. 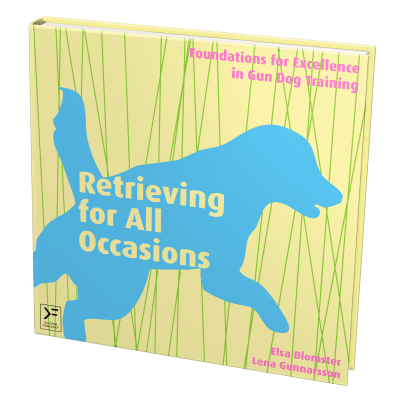 Åsa does obedience and rally obedience, but the retrieving and delivery to hand training is the same so you’ll get lots of tips on how to train your dog to retrieve an object. We’ve split them into four blog posts and this is the second one. Enjoy! 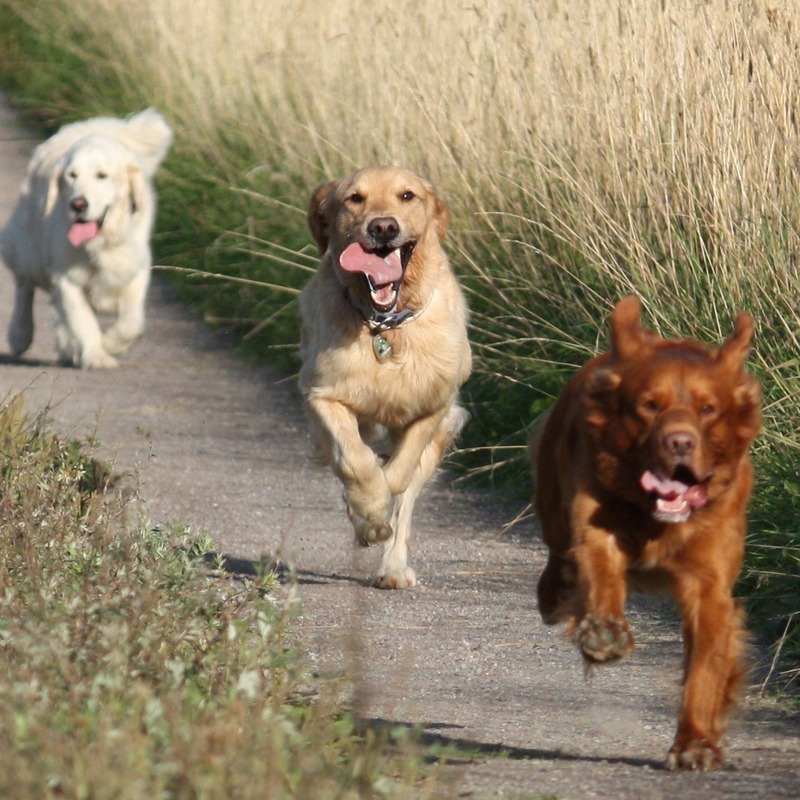 It is difficult for many dogs to take an object and continue to hold on to it until we give the dog a reward signal or cue the dog to let go off the object. I want my dog to hold the object in a relaxed way, but at the same time with a firm grip (the object should not “rattle”) and it should be still in the mouth (no chewing). Move slowly away from the dog with the dummy, let the dog take it, but instead of using the clicker at once let the dog pull a little. Click when the dog puts her weight backwards and continues to pull. Do this exercise when the dog is standing and sitting. Count while the dog is holding the object: 1 – 3 – 2 – 4 – 3 – 5 seconds. Hold on to the dummy while you let the dog carry it. Hold on to the dummy and let the dog sometimes carry the weight by herself and sometimes you pull a little bit in the object. Be sure to use the clicker exactly at the same time as the dog decides to pull the object. Hold the dummy together with the dog and say, “good”. Click so that the dog continues to hold the object. Hold the dummy together with the dog and pet the dog with your other hand. Let go of the dummy but continue to hold your hand close to it. Be sure that the dog is holding the object firmly before you cue her to let go of it. Then when you grab the dummy a little, it will be just like a reward signal to the dog, like a “little click”. Don’t catch the dummy if the dog releases it too early. If you have a dog that is sensitive to sounds connect the sound of “a dumb bell falling to the floor” with a reward, to avoid that the dog gets frightened. Yes, it may give the dog a little reward to drop the object too early, BUT if the dog is frightened by the sound, that is a much bigger problem. Release the dummy, pet the dog, hold on to the dummy, and click. Release the dummy, move your hand around the dog’s head, hold on to the dummy again, and click. 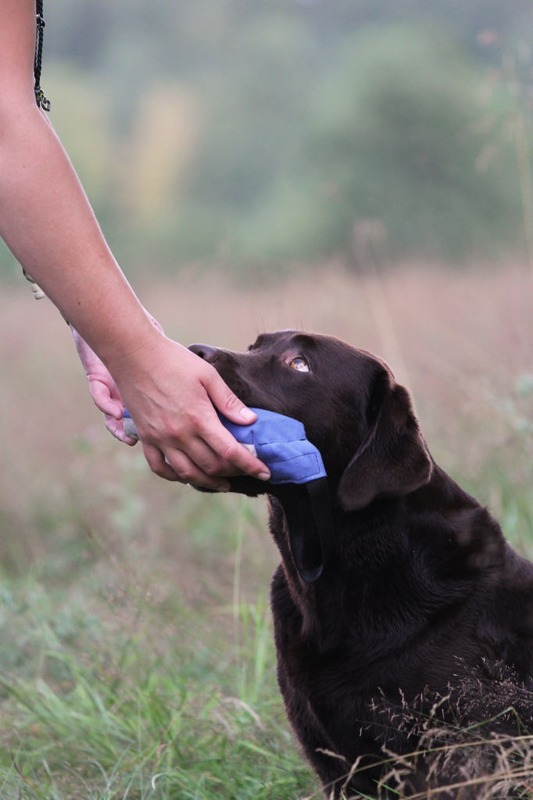 Use reversed luring – the way the dog gets the handler to grab the dummy (leads to the click) and then the dog will learn to hold the dummy despite having tidbits right in front of her nose. Let the dog hold the dummy without any distractions. Let the dog move around with the dummy in her mouth – follow your target hand, walk towards you, walk by your side, and change position. ​​Train specifically that the dog can sit down while holding the object firmly and then get into position by your left side. When you want the dog to do something with the dummy in her mouth repeat the exercise without an object a few times first. Spontaneously if possible, then it doesn’t matter if the dog gets it “wrong”. Let the dog beg for a taste of your dinner by sitting and holding a dummy next to you until you see how good she is at holding it (have the dummy beside the dining table). Let the dog have the dummy in her mouth while you cuddle with her. Extend how hard you pull the dummy until you more or less are able to lift the dog in the dummy. Proof the tug of war game so that the dog holds on to the dummy even though you tempt the dog with a better toy/tidbit. Ruffle the dog in the tug of war game so that she gets a firm grip (slap the dog’s sides, use a “hard” voice, growl at the dog – and all this should be a signal that means, “play more, this is fun!”). But use this with caution! When the dog is some distance away from you – throw the reward to another dog/eat it yourself, if the dog releases the object too early. Vary the difficulty of the exercises all the time! Give the dog the tidbit in the mouth while she still has the dummy in her mouth – use soft cheese or liver paste. Use the tug of war game – play the game, release the toy, let the dog follow you for a couple of steps, grab the toy again, play the game again, release the toy, let the dog follow you, and so on. Always avoid switching to a different toy if you reward the dog with play – use often the dummy in the tug of war game. Teach the dog a keep going signal, for example that you gently praise the dog, or – more suitable for a trial – breathe in a certain way. 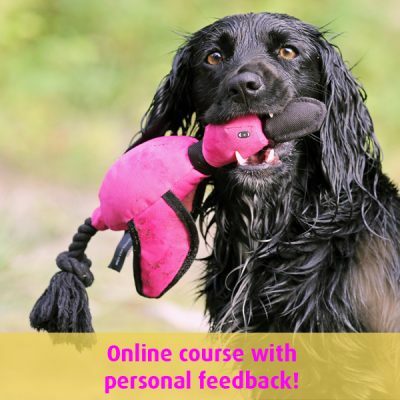 Teach the dog an “error signal” such as “oh oh” or something similar to that. 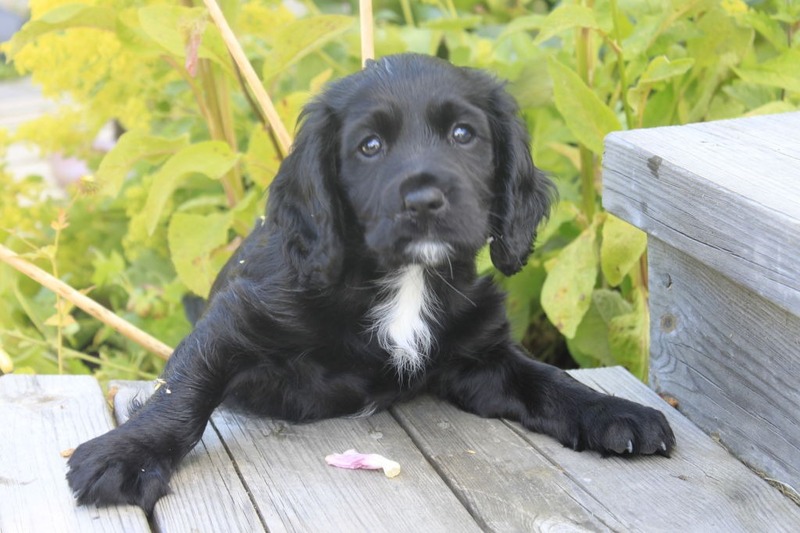 If the dog drops the dummy when you are participating in a trial, it is of good use to you that the dog chooses to pick it up voluntarily – this is worth to consider! Good luck with your training! We’ll be back with the remaining two blog posts soon.